Videoism Blogger Template. 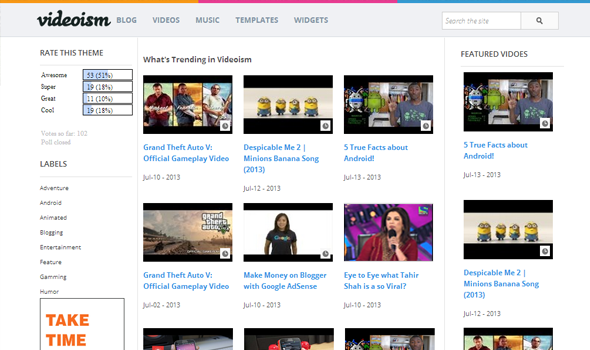 Videoism is a professional video hosting blogger template designed for video site and video blog portal. This template would help everyone in setting up a professional video site rather quickly. Video Hosting: This template allows you to host video clips from YouTube, Dailymotion, Metacafe and etc. You just need to paste the embed code, and it would automatically fetch thumbnails. It means there is no need to add images manually the way we do with normal blog templates. Static Homepage: The Home page of this theme is static. Thus, the featured post thumbnails and few more gadgets would only appear on the homepage so it may not reduce the user-friendly experience of your visitors. If you would use the old Video Embed code, it may not show the thumbnails. Therefore, make sure you use the following technique to embed your videos. Go to Blogger >> Add a new Post >> Html Tab >> Paste the code there and replace the Video URL. Now either replace "Feature" from the following coding to a keyword that you want to use as a Label so show up posts in this featured area. On second thoughts, you can tag your posts with "Feature" label and those posts would start appearing. We hope this template would help you in setting up your very own video hosting site cheaply at Blogger. The speed and the performance it is quite brilliant and the plus point is that it is cross browser supported. Let us know what are your thoughts about this template in the comments below?